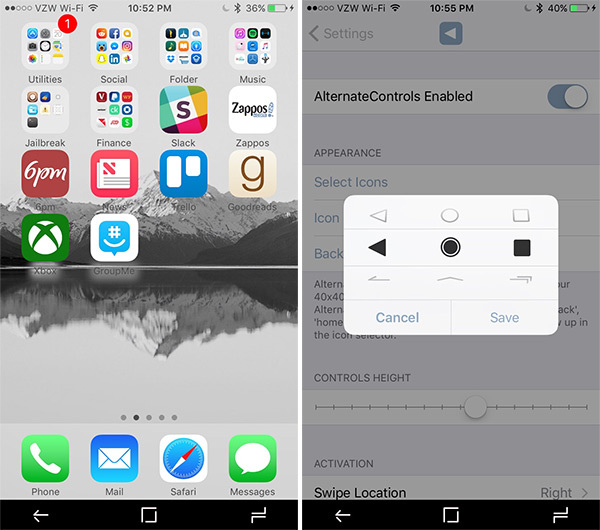 AlternateControls 2 lets you add Android-like on-screen navigation buttons to any iPhone or iPad running iOS 10. Here are the details. For those of you who are iOS users, and who love some of the navigation paradigms and certain aspects of the Android platform, then this new AlternateControls 2 tweak could be the tweak that you’ve been looking for. It not only introduces an Android-style soft navigation bar, but it also has customization options to make that new control type extremely useful. One of the great things about this package is that it comes with a fairly decent level of control over what it actually looks like. It isn’t just a case of having a bar of controls that the developer has designed, placed onto the display with the chance of messing with the rest of the design and styling of the OS. There’s a certain amount of pre-defined visuals for this bar and the icons, and then there’s also the ability for users to add their own 40-by-40 pixel icons into a specific folder on the device to theme it how they wish. Users also able to control the height of the control bar as well as define the gesture which actually brings the bar and controls into play. As a default, this is set from a swipe up on the display, but using Activator it could be pretty much whatever that person wanted. There is also the additional option of choosing what the buttons actually do as a call to action when interacted with by the user. In fact, there is quite an extensive selection in the control panel that ships with the package, which only adds to the power and appeal. Apple has done a wonderful job of pushing iOS forward with new features and improvements, but it’s likely that this tweak will be seen by many as a decent way to add to that functionality. It is a quick, easy, and lightweight installation which should hopefully go without a hiccup and instantly give iOS device owners a different way to interact with and navigate through their own device. 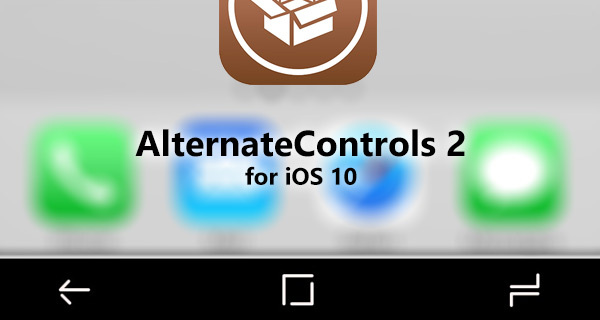 AlternateControls 2 is available from the Big Boss repository. Those interested in the package, and who have an iOS 10-powered device, can grab the package for $1.49.